Your LinkedIn profile is more than just a boring online resume (or one big blob of text). Isn’t time you start treating it like an online portfolio? 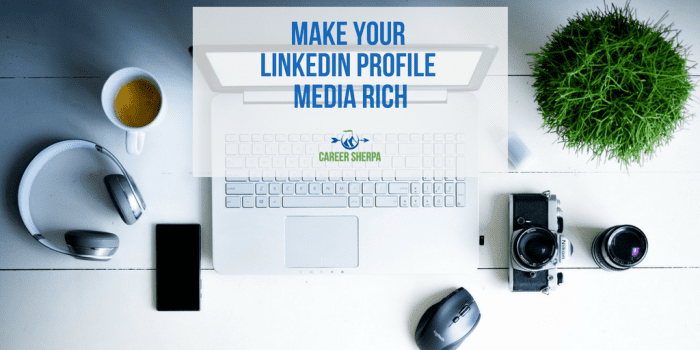 Learn how to make your LinkedIn profile media rich! Company websites and commercials contain customer testimonials, product demonstrations, and visual proof of their products. You can too! It just takes a little creativity- ok maybe more than just a little, but you can do it! Your challenge is to think like a marketer! Think about ways you can use video, presentations and images to convey your message. 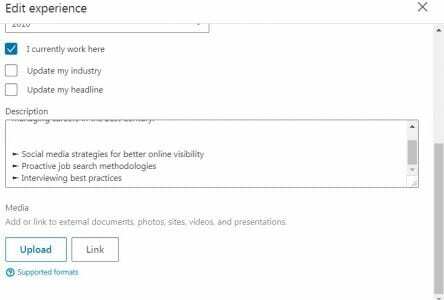 LinkedIn says it officially supports images, video, audio, presentations and documents by certain providers listed here. Go to your profile and click on the blue pen to edit. You can use a link to a webpage or uploaded file- both work! Where can you embed media in your profile? They can be part of your summary, incorporated into each position listed in your experience section, and in your education section. What differentiates you from the hundreds and thousands of other people who have the same job title as you? Think about the things you did that made you feel proud. Or think about what you can show to prove you know how to do your job. Is there a picture of you receiving an award? Have you given a presentation or spoken at a conference? What would you want someone to find if they were searching for you on the web? These are the images, articles and content you can create and publish yourself online. Think of your LinkedIn profile as a brag book and please, begin collecting screenshots and links today. If you don’t have anything, create it! 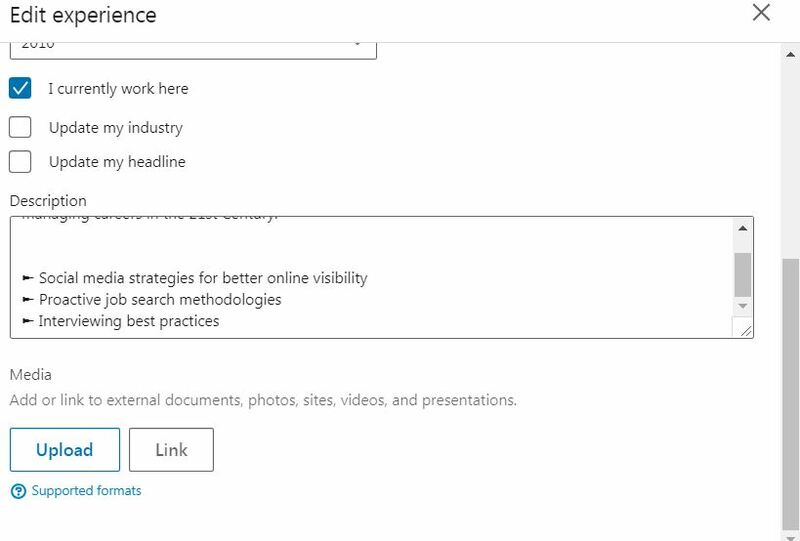 You can create a PowerPoint highlighting your accomplishments and publish it to SlideShare. This is fairly simple to do. The most difficult part is figuring out what you will put into your PowerPoint presentation. Search around SlideShare and get ideas from other people who have created online resumes or personal profiles. If you are interested in creating something a bit jazzier than PowerPoint, you may want to test Prezi.com. Here are some presentation ideas I’ve gathered. Letters of recommendation: You have probably received letters of recommendation or testimonials from past customers. Why not create a presentation featuring these quotes? Just be sure to ask permission to use the quotes or testimonials from the people who have written them. And by the way, this is a great opportunity to re-establish your connection with these people. Work samples: You may have created reports, work instructions, workflow diagrams and other content as an output of projects you worked on. While you may not be able to use the actual documents, you could create a mock-up to share. Upload your work samples under the job in your experience section. Video: Everyone may not be comfortable in front of a camera, but the video doesn’t have to be your face. It could be a “how to” video. For example, you could create a video on how to create pivot tables, or how to create project plans, or how to organize your email. Use screencasting tools to record your demonstration and upload it to YouTube. Just remember to keep it short. Most ads run under three minutes. Other video ideas might include showcasing photos or images. Animoto.com can turn these into a 30-second video and publish it to the Web for free. Be Creative. The resume is not the only way to demonstrate what you’ve done. Today, there are many more options to publish content and create a robust, interactive representation of who you are. LinkedIn has become the go-to source for employers seeking new talent. Make sure they find more than just a boring profile.